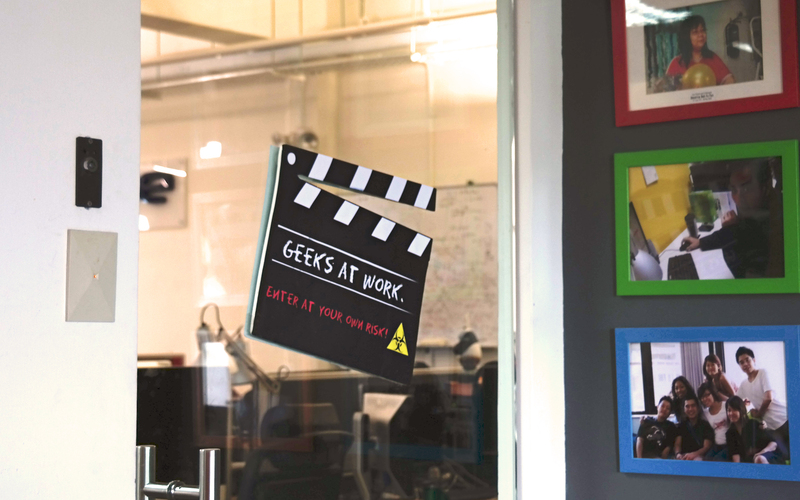 From filling non-existent positions, to hiring only the smartest, to having a matchless, jealousy-inducing pantry in the office, we spoke to Terence Swee, Founder and CEO of muvee Technologies, to discover his modus operandi for building the ideal team. One fine Thursday afternoon, being the new kid on the block in the heart of Singapore’s start-up ecosystem, a colleague and I took an afternoon stroll around the block, introducing ourselves and TalentDash to our neighbours. We hoped to speak with the founders of the many start-ups that are nestled in Ayer Rajah Crescent’s historic Block 71, a 40-year-old building that used to contain factories. Eager to learn more about the different companies’ hiring practices, we found ourselves talking to Terence Swee, Founder and Chief Executive Officer of muvee. With a mug of tea in his hands, he greeted us enthusiastically, welcoming us to the block. The story of muvee, which he then recounted, was too inspiring to withhold its insights from our readers. Terence, an electrical engineer by training, graduated from the National University of Singapore with a Master’s in Digital Signal Processing. He founded muvee in 2001 with his then boss, Pete Kellock, when he was still just a researcher doing music analysis. Both of them were—and still are—passionate about music; Terence plays jazz piano, and Pete has a Ph.D. in Electronic Music and a Master’s in Music. They used this to their advantage in developing muvee’s editing software that cuts videos to the beat of music automatically—the first in the world. It started as a software for personal computers but has since expanded to mobile devices, focusing on action camera and drone users: the fastest growing market. As Pete, the first CEO, is no longer in the business, Terence is now at the helm. The glass door that separates the main working space from the pantry. 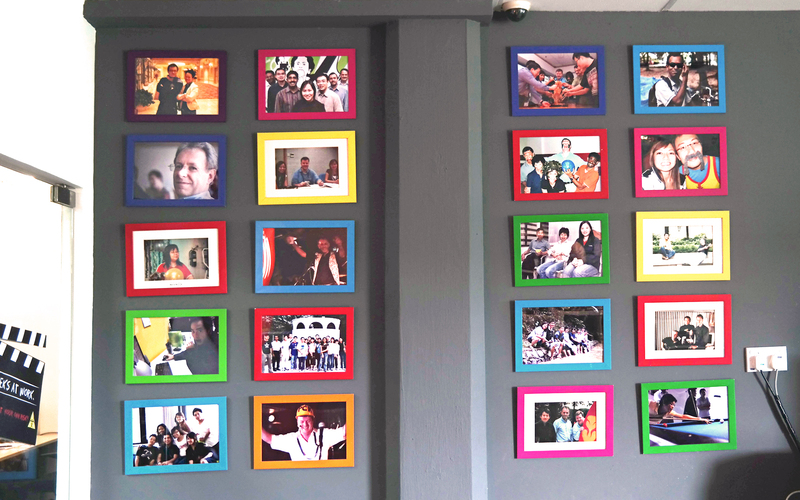 Their pantry’s wall is decorated with delightfully crooked, colourfully framed company photos which radiate a sense of homeliness. Finding smart people is one thing but some thought has to go into making them want to work for you—and keeping it that way. 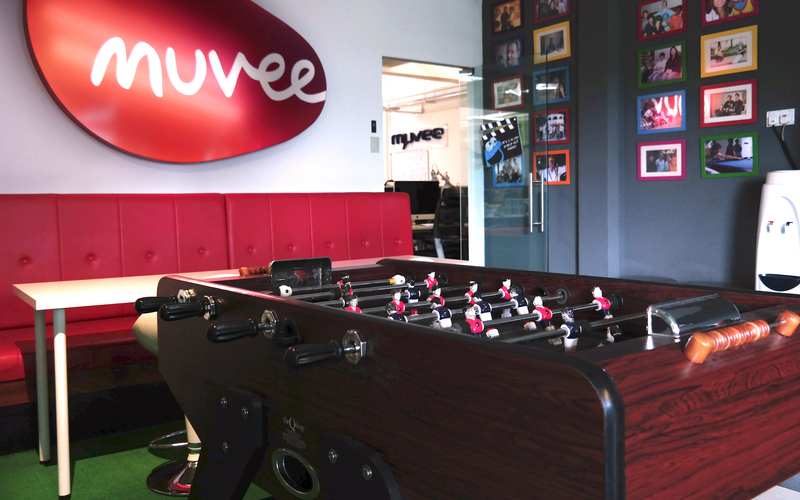 So, of course, muvee played well into the efficacy of employer branding. “We’ve had articles written about how cool our office it. This was way before Google had fancy offices; before it became fashionable,” Terence proudly shared. muvee’s iconic “Auntie’s Diner” sign; styled like an American diner, named after their tea lady. And cool, their office is indeed; we saw it first hand on a personal tour. Their pantry is styled like an American diner, complete with red seats, a foosball table, a bar area decorated with American car plates, and a matching, red la Scala coffee machine. 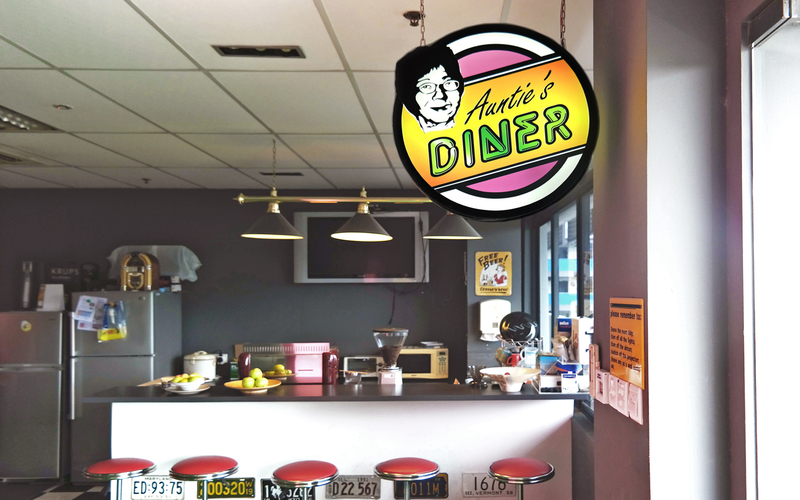 Named “Auntie’s Diner”, Terence shared that it is named after their tea lady, whom they affectionately address as “Auntie”. She has been with muvee since its humble beginnings. Our tour dove deeper into the heart of the office. In the main working space, there is a TV area with a couch and bean bags for staff to take naps. After all, a good break is essential to maintaining the flow of creativity. With all these simple perks that create a homely environment, who wouldn’t feel a sense of belonging working here? The foosball table sits in the centre of the pantry, allowing staff to have a game and wind down just a few steps away from their work area. Muvee’s story is exemplary of the way start-ups can expand while keeping closely in line with their values and vision—a move, essential to building not just a well-defined brand for the company and the product, but also as an employer. Terence’s special sense of handpicking talent as he travels also ensures that he never misses a catch. In essence, he does not impose limits to the talent pool, and in doing so, he has managed to build a robust team by snagging great talent. We would like to thank Terence who made time to share muvee’s story with us, and also for showing us the office. If you have any interesting story to share, please contact via email at admin@talentdash.com.